Welcome to Available Video Productions’ Website! We provide all types of video productions …. creating memories for you and your family or helping Industry & business productions including 30/60 second TV/Cable Spot Commercials, Musical Jingles, legal issues / Depositions, Private Investigation, Music / Band videos and more! A young couple in my office was upfront about deciding whether or not to include professional video in their budget. I asked them to picture themselves owning a film of their grandparent’s wedding day and how much it would mean to them. She replied that her grandparents did indeed hire a professional to record a 16mm film of their wedding. That was precisely the point! Having a professional wedding video produced will provide joy to your family now and for generations to come! Cap­ture the romance by investing in a professionally produced wedding video. 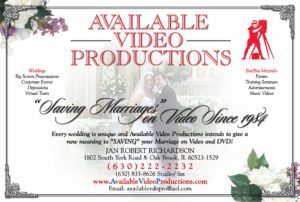 Not only will we video your wedding, but we will consult with you to create the perfect wedding experience! Experienced in all business applications, Available Video Productions can help with legal / Communications / copyright issues, Industrial & real estate virtual tours, TV ads and more. We are digital video geniuses! We can create HD digital photos from videos! Call us @ 630-222-2232 to see how we can assist you with any Video and Media needs you have. Sit back and enjoy your event. Website by Deb Manning Inc.